experience harlem | HarlemGal Inc. 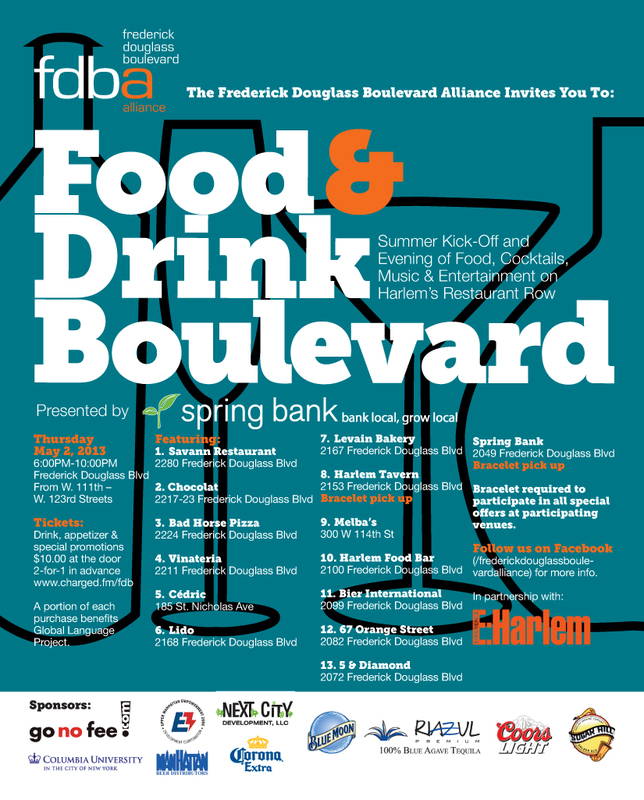 The Frederick Douglass Boulevard Alliance and Experience Harlem invite us all in Harlem to their annual Food and Drink Blvd event, which is an evening of food, cocktails, music, and culture featuring most of the dining establishments on Harlem’s restaurant row, aka Frederick Douglass Blvd. The event takes place Thursday, May 2nd, from 6-10 pm. The cost to attend is $10 in advance. To purchase tickets for this fun event, go here. Have you ever wanted to check out several drinking and eating establishments in Harlem in one night but never had the time? You’ve read about Harlem’s booming restaurant row on Frederick Douglass Boulevard in various publications and wondered what’s it like? Well, now you have the opportunity to see and experience several fine dining establishments all in one night at Experience: Harlem Bar & Restaurant Crawl taking place the evening of October 28 from 6 PM to 10 PM. Experience: Harlem, one of the early pioneers in promoting all things positive about Harlem, has rounded up some of Harlem’s best restaurant and drinking places for this event. They are: Mojo, 5 & Diamond, Melba’s, Questan’s, 67 Orange, and more! Tickets are $15 in advance or $20 at the door. Click here to purchase tickets.